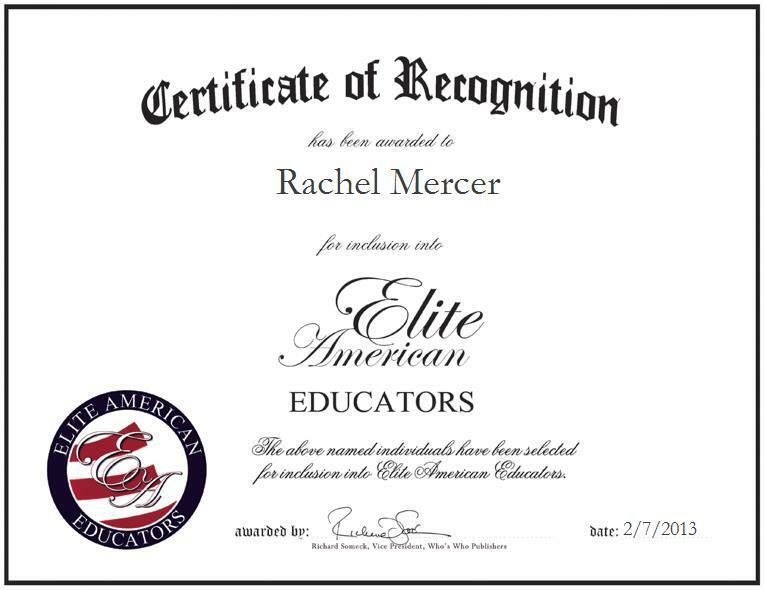 MOSS POINT, MS, February 7, 2013, Rachel Mercer, Coordinator of Instructional Technology for the Moss Point School District, has been recognized by Elite American Educators for dedication, achievements, and leadership in technology instruction. With heightened proficiencies in the integration of technology into the classroom through student-centered, project-based instruction offered by a teacher using various forms of technology, Ms. Mercer expertly trains teachers, administrative staff and interns on the effective usage of technology in education and good curriculum instructional practices. She has built on an ever growing skill set over the course of a successful career as an educator and trainer, and she continues to strive for excellence in her every endeavor. Ms. Mercer has been considered by those she teaches to be an expert in the area of training on technology curriculum, and she continues to sharpen her skill set. She is currently pursuing a Ph.D., and she holds a Bachelor of Arts in Secondary Education from the University of Southern Mississippi. She feels that the most gratifying aspect of her career is seeing the students and teachers she trains become excited about technology. Ms. Mercer is an elected board member of the Mississippi Educational Computing Association, and she is also a member o f Phi Beta Kappa. She feels that she has been able to thrive professionally due to the support she has received over the years from her family and colleagues, and to her constant and unwavering faith in God. Ms. Mercer enjoys reading Edutopia and District News in her spare time, and she also takes pleasure in running races.